The world is changing at a pace never before witnessed. Businesses are formed overnight, funding is given with no track record of P&L or profit history, teams work remotely, experts join together and disruption is the new norm. The old businesses need to be nimble to keep up and sadly many are not able to do this. As a corporate professional, your job is at greater risk than ever before. As corporate processes change, companies around the world will downsize and automate to retain profits; they will also jettison employees that are a cost to the company. If you have kept in touch with what’s happening in the world currently, you will realize that it’s time to start building your own economy and stop depending on a monthly paycheck. The truth is this – you will either willingly disrupt (change) your current way of life, or your current way of life is going to be disrupted. There is no better time than now to start your own business and become an entrepreneur. Now is the time to take charge of your future and to secure your own financial freedom. How do I find the idea that I can make into a profitable business? How do I get the right coaching, so that I can avoid the pain of expensive mistakes and also enjoy the pleasure of speedy rewards? How do I earn more wealth, while doing what I love, with less stress and struggle? How can I master this ever-changing and dynamic world of business and wealth? How do I create a brand that gets seen in all the noise and distraction? How do I take the first step and actually start? 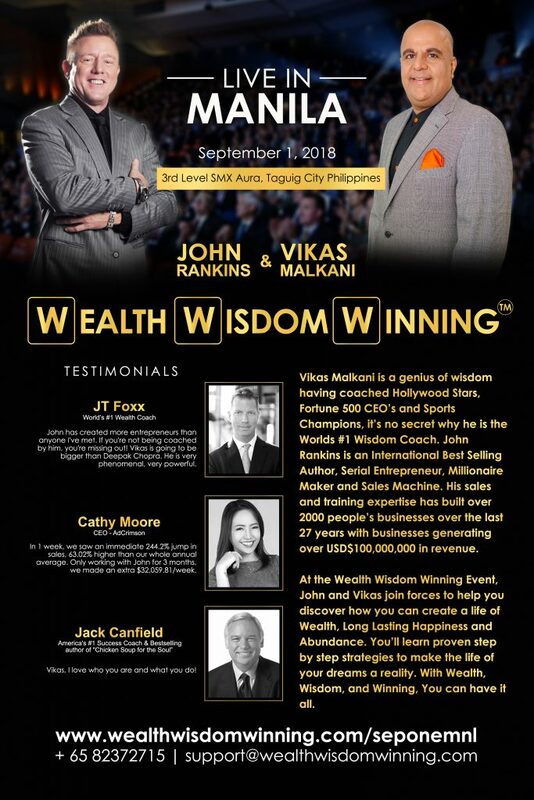 If you have pondered on one of these questions then sign up rather quickly for the Wealth, Wisdom, Winning Event on September 1 to be held at SM Aura Premier, Mckinley Parkway, Taguig City 1630 Philippines. So why Wealth and Wisdom you may ask? Well, that’s easy to answer! Have you noticed the super rich who seem to have it all, yet are very stressed, look unhappy, do not trust anyone and have very few real friends? Have you wondered why suicide rates of the famous are on the rise? Rock stars, fashion designers, chefs….they seem to have it all yet are empty inside. Have you wondered why the item you worked hard and saved up for months to purchase, made you happy only for a week, and now you are looking for the next shiny new object? Have you noticed how people struggle to create wealth and in the bargain also lose their happiness, inner peace, and joy? Wealth alone is not a sign of success! And on the flip side, there are thousands of so-called happy people on the streets who cannot even afford to pay their bills. These are the people who have a job, a family, kids, a small home, but they struggle to pay their bills. They cannot follow their dreams and they do not feel free to live the life they dream of. They do not enjoy financial freedom! Happiness by itself is also not enough! Happiness alone is not a sign of success. To be a winner in Life, you need both Wealth and Wisdom. Life is fulfilled when you can have the outer Wealth to enjoy the life you want, and also have the inner Wisdom to stay stable, stress-free and at peace. Success without Struggle, Wealth with Wisdom, A life of inner and outer Abundance and Prosperity – that is what we are here to show you! We believe you need both! We believe you can live life on your terms and in order to do that you need the right coaches who can give you the secrets of how to get both wealth and the inner wisdom of happiness and contentment. We will show you the steps to get there and in addition light your inner fire to understand the tools and techniques needed for a happy, positive and peaceful mind. 2 leading authorities on Wealth and Wisdom, John Rankins and Vikas Malkani have come together to coach you step by step on how to create the life you desire, deserve and dream of! They have made it their mission to educate the world on Wealth, Wisdom and Winning at life. John Rankins, called ‘The Millionaire Maker’, started with nothing. Holding down multiple jobs as a child to pay his family bills, he did not graduate from school. Today he is a multimillionaire and serial entrepreneur. He has built multiple businesses over the last 25 years and generated over US$100,000,000 in revenue. Vikas Malkani, the World’s # 1 Wisdom Coach, has coached Hollywood stars, royalty, multimillionaires, sports champions, Fortune 500 CEOs, and countless experts to maximize their personal and professional success. He holds the secrets to a prosperous, happy and positive life no matter what! 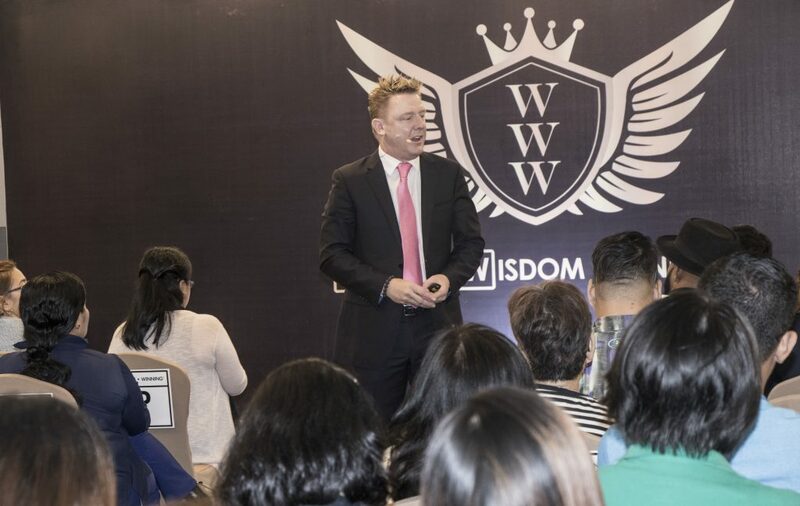 Wealth Wisdom WInning is a world’s first! Never before has such a depth of real-life experience and expertise been seen on one stage. This is a world’s first – an opportunity to be coached by 2 legends, who are both authentic leaders and live a life of Wealth WIsdom and Winning themselves! This event transforms lives. The movement has started and already success and happiness are happening around the world! It’s your time and your turn! When you make a decision, you create your own destiny! 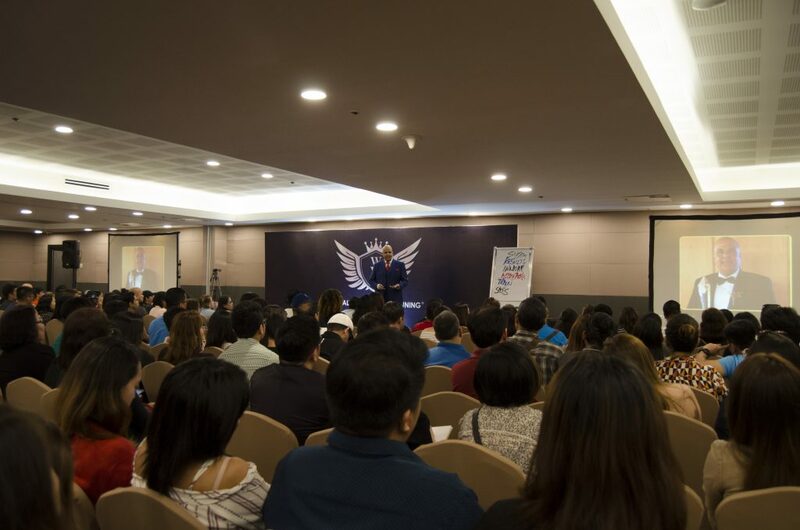 If you have a corporate job, are a business owner, an entrepreneur, trainer, coach, teacher, speaker, expert or consultant, or you are fed up of the struggle and want to live a bigger life, then the Wealth, Wisdom, Winning Summit will be a game changer for you. If you are in a job yet long to start your own business or if you need clarity about your life purpose and direction, then you must be in the room! You will meet 2 authentic and legendary coaches, leaders in their field who are walking the talk and living a life of WEALTH, WISDOM, WINNING! Strategies and Techniques you can apply immediately on how to create more Wealth and Wisdom in life. Meet and connect with a network of other like-minded individuals from all over the world. WEALTH, WISDOM, WINNING – HAVE IT ALL!